Kylie did some distance Ho’oponopono healing for me that was powerful beyond words can really explain. Although the hour spent focusing on my healing seemed as though nothing was happening things certainly shifted after that and improved my life. I highly recommend Kylie for Reiki and Hoponopono Healing. I went to Kylie a couple of years ago because I was wondering why I was not able to foster a healthy relationship. Kylie is intuitive and uses a range of tools and techniques that have helped me work through things and heal. The work I have done over the last couple of years with Kylie has helped me navigate, enhance and reshape my personal relationships and improve my self-esteem. I now feel happier, more authentic, plus I have some fantastic relationships. "I have been going through healing therapy with Kylie for a bit now and have been in the process of opening closed wounds so I can heal properly. I went through some hard times when facing my darkness, but can happily say that after my Ho'oponopono session, the universe has been kind to me again and feel happy and fortunate with the blessings I have received. 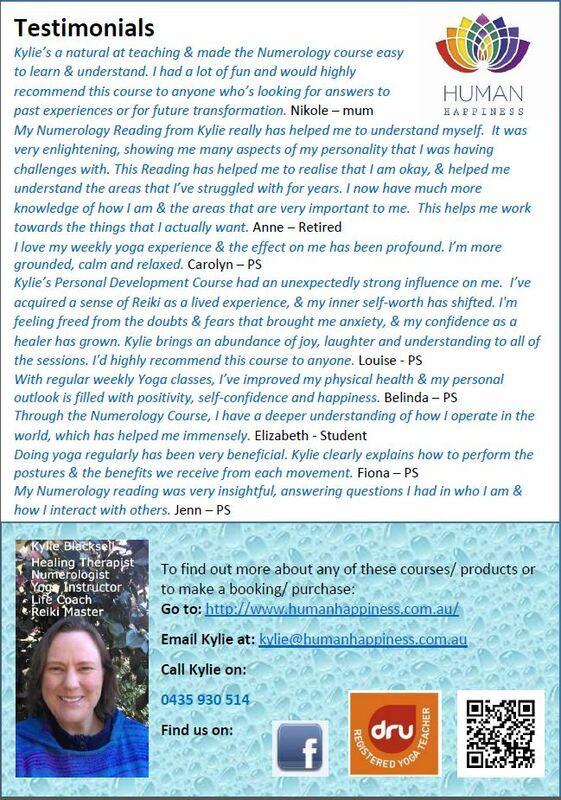 I have been able to focus more at work and my personal life has never been better than right now, thank you Kylie"
I have been doing Dru yoga with Kylie for nearly six months. Since doing this, I have been able to find a space of calmness and clarity within myself even when I am facing challenging times. Kylie is amazing. She is a gentle, inclusive and intuitive yoga instructor. I recommend her classes highly. I began yoga with Kylie late last year. I come to class in a very agitated state and depart a lovely relaxed human being. Yoga is now a vital and positive aspect of my life. It is something that I look forward to on a weekly basis. In the 6 months I have been attending Kylie's Tuesday evening yoga session, I have improved my physical health and my personal outlook is filled with positivity, self-confidence and happiness. Kylie encourages all members of the class, gives insight into what is happening around us and ensures that we are all comfortable and at ease. Tuesday is the highlight of our week and I wouldn't hesitate to recommend Kylie's sessions to anyone. I love my weekly yoga experience and the effect on me has been profound. I am more grounded, calm and relaxed. When I walk out of a session I feel like I am floating on air. Yoga started as a flexibility, back strengthening and exercise in my retirement. But it has also given me rewards in friendships with like-minded people and renewal strength and faith for managing past and future aspects of life. Doing yoga regularly has been very beneficial. Kylie clearly explains how to perform the postures and the benefits we receive from each EBR. Kylie’s yoga studio has a great atmosphere and Kylie is an encouraging and supportive teacher. I attend Kylie's Dru yoga sessions once a week. I have anxiety and I feel Dru yoga is really helping to connect to my inner calm/peace. Kylie is such an uplifting person to be around and the yoga environment is always a calm, warm place to be. Thankyou Kylie. My 12 year old daughter had had trouble sleeping for 12 months - she had trouble going to sleep as she worried about dying and other dark thoughts. In the daytime she was a happy carefree girl but became increasingly tired and irritable due to the lack of sleep and disrupted sleep patterns. We had tried several relaxation etc techniques before going to the GP to ask for assistance. At the GP, I said how I wanted to explore other natural avenues, and that I had heard on the radio an ad for Insomnia workshop for teenagers by Human Happiness, and my GP encouraged me to try the workshop first, saying my daughter was too young to start medical therapies and medication. On contact with Kylie, I found her warm, engaging and intriguing and only after one one-on-one session with Kylie and a month of nightly affirmations, my daughter has slept like a log ever since - amazing! A few months ago, my 10 year old son told me how he could see and hear dead people and had also experienced distorted visions at different times in the day and night, and how frightened he was because of this as he had asked his friends at school and they did not know what he was talking about. I was initially scared thinking he needed a psychiatrist but then contacted Kylie for advice. Again, within one session with Kylie and only two weeks of nightly affirmations, my son was able to accept and celebrate his 'gift', he practiced his strategies of calling upon angels to help with these sounds and visions, and since then, he rarely experiences these visions or sounds anymore. As a result, he is now a happy, confident, well-adjusted kid and when I asked him what changed for him after Kylie's session and the affirmations, he proudly announces that he has a 'gift' and he now knows how to keep himself safe and happy - amazing! One night when I was awake worrying about an issue of my own, I retrieved my son’s affirmation recording to listen to it in bed. I was so interested in hearing the narratives and I quickly realised how soothing, empowering and relaxing they were and I indeed fell asleep before the end of the recording. I enjoyed talking to both of my children about the affirmations, and I have also enjoyed them 'comparing notes' as to what Kylie did or did not say or do in their individual sessions. Whilst Kylie's techniques could be considered unusual and unconventional, they do indeed work and I am huge fan of her therapies, professionalism, care and capacity to dig deep into my children's psyches to explore and relieve their worries, to tap into their gifts and goodness, and to allow them to feel strong, safe and secure within themselves and within the emotional, physical and spiritual worlds they live. I went to Kylie for a Reiki session in April 2015 and not knowing what to expect I found Kylie to be very warm, empathetic and friendly which made me feel comfortable and at ease with the whole process. The session was incredible; Kylie is a very gifted and passionate Reiki therapist. After only a few days I felt noticeable relief from a long standing ailment for which Kylie was able to help alleviate beyond my expectations during the Reiki session. I have since had a second session with Kylie and plan to have a few more! I can highly recommend Kylie and Human Happiness to anyone wishing to try Reiki. After my session I've been feeling more confident within myself. The day I saw you I was close to panicking as I drove to your home and before I walked in, however the day after the reiki I drove to work alone with no hassle. In fact, every time I've been out since then I haven't felt any panic and the anxiety seems to be getting less and less intense. I also went down the coast with my partner and it's the first trip we've had together where I haven't been sick or anxious. I even opted to stay at my partner's friends house - usually I would want to stay in a separate place but I felt so confident and relaxed that it didn't really matter. I'm finding it generally easier to be myself; that is, allowing myself to be me without worrying too much about if anyone else will approve. I feel happier. I have had some days where I've been unwell or low on energy but I don't seem to subconsciously dwell on it as much - if that makes sense. Your reiki session, plus the acupuncture I get done has just been amazing for me. Thank you so much for offering that session to me, and being so welcoming and easy to talk to. It means the world to feel better within, to have less of a battle going on and more flow. I will have to book another session with you sometime soon and hopefully be able to pay you for the wonderful work you do! I hope you are well and that you have a lovely Christmas and a Happy New Year. Kylie is a passionate healer whose aim is to help every being blossom to their full beauty and potential. Her work isn’t limited to her immediate clients, but a gift to be shared and spread through to whole of humanity. As a yoga teacher, Kylie possesses amazing energy, enthusiasm, knowledge and dedication. She is generous of spirit, guiding her students to achieve overall well-being. THANK YOU! I have sincerely appreciated the support given to me by Human Happiness, Kylie has been inspirational with her one on one personal development during my difficult divorce. She was able to help and guide me with a plan suited to my needs. I also attend her yoga lessons, she is always welcoming and has a variety of gentle to more challenging exercises that everyone can do. I was fortunate to receive a Reiki session from Kylie. Unsure of what to expect, Kylie quickly put me at ease, clearly explaining the process. Kylie’s nurturing but professional and confident manner meant the session went really well. I am happy to recommend Kylie to others. Kylie's has a professional approach which is very personal and caring and delivered within an atmosphere that is warm and friendly. I recommend her supportive practise to those who are new to Reiki, as I am. I was initiated again with my Reiki 2 with Kylie. I found Kylie to be a very caring, kind highly experienced practitioner who understood what she was doing and had an in depth knowledge of Reiki & other healing modalities. She defiantly brings you into a place of love, safety and connection. I would not hesitate on recommending Kylie, she has gifts to share. In May 2014 I was lucky enough to make the acquaintance of Kylie Blacksell at a Yoga Module Workshop in Brisbane. By the end of our four days of Yoga together I requested a Reiki "Tuning in" (have previously done Reiki One). I can't really understate this but…after four days of being balanced with Yoga I had a truly Spiritual Experience with Kylie! I left open and truly balanced having been impacted on in a very deep and personal way. Had a moment in time I will always remember and now I feel I'm back on the right life path. Thank you Kylie for a great gift. I have attended many of Kylie's Yoga sessions and I always find her meditations, visualisations and deep relaxtions very comforting, soothing, revitalising, energising and calming. She has a very confident, calm and soothing voice, and uses a language that can be clearly understood. I have no hesitation in recommending Kylie as a Yoga Teacher.